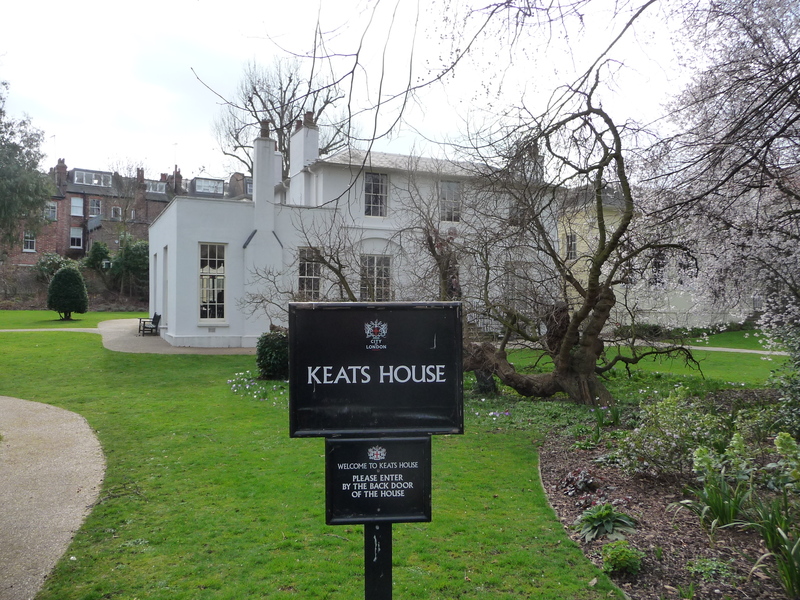 Yesterday we went to Hampstead to visit the house of John Keats. It’s where he lived with Charles Brown just before going to Rome to die and where he fell in love with Fanny Brawne who lived next door. The house is very lovely, the day was sunny, and the sense of the poet, his devotions, and not least the brief passage of his time on earth was very palpable. We walked on Hampstead Heath for an hour, among racing dogs, children on bikes or foot (“Look how I’m running not in the mud!”, called a small girl to her mother, showing that her red shoes were still clean…), birds, nesting swans on the reed-fringed ponds, and everywhere the smell of spring. We followed this with lunch in Paradise, an Indian restaurant recommended to us by a guy we met in Roznov. He promised that it would be the best Indian food in London and I’m not arguing. We hoped to get tickets for War Horse last night but it’s sold-out until April so instead we got last-minute seats (good ones) at Offenbach’s Tales of Hoffmann, an innovative and funny production by the English National Opera. Today is our last day in London before we fly back to another kind of paradise. We’ll spend it here in Bloomsbury, going to the British Museum, taking in a concert this afternoon at St. George’s Bloomsbury — the Akoka Quartet performing Olivier Messiaen’s Quartet for the End of Time. ~ by theresakishkan on March 11, 2012. This entry was posted on March 11, 2012 at 8:59 am and is filed under Uncategorized.You can follow any responses to this entry through the RSS 2.0 feed.You can leave a response, or trackback from your own site.